Vitamins are natural food substances found only in fruits and vegetables. They are necessary for our body to function properly, for growth, energy and for general fitness. Here is Vitamin chart and it’s characteristic. Also list of fruits and vegetables containing vitamins. Vitamin A: Vitamin A helps blood cell reproduction. It also improves immunity system. Many fruits contain Vitamin A like Cantaloupes ( Kharbuja ), Oranges, Tomatoes, Sweet Potato and Watermelon ( Tarbuj ). 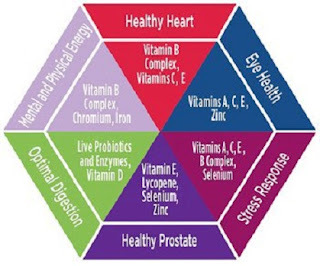 Vitamin B1: Vitamin B1 improves production of energy. It helps to converts carbohydrates into energy. Watermelon, Banana, Apple and Cherries contain Vitamin B1. Vitamin B2: Vitamin B2 is necessary for body growth. Less fruits and vegetables are containing Vitamin B2 like Grapes, Lemon, Blackberries and Mango. Vitamin B3: Vitamin B3 helps in operation of the digestive system. Cantaloupe, Tomatoes, Bananas and Potatoes, Mushrooms contains Vitamin B3. Vitamin B5: It helps metabolization of food and development of hormones. In fruits Oranges, Bananas, Corn and in vegetables Sweet Potato, Potatoes, Mushrooms, Cauliflower ( Gobhi), Carrots ( Gajar) contains Vitamin B5. Vitamin B6: It helps to maintain nervous system of human body. Peas, Bananas, Watermelon, Potatoes, and Carrots contain Vitamin B6. Vitamin B9: It helps in the formation of DNA and maintaining normal brain function. Blackberries, Orange, Strawberry, Bananas, Spinach (Palak), Green Pepper, Carrots, Onions contain Vitamin B9. Vitamin B12: It helps in the formation of red blood cells. B12 is available in fish, poultry, meat or dairy food. Vitamin 6: Vitamin C is important for human body because it protecting body tissue from the damage of oxidation. Bananas, Apples, Lemon, Grapes, Cauliflower, Cucumber, Mushrooms, Onions, Potatoes, and Carrots contain Vitamin C.
Vitamin D: Vitamin D is necessary for regular development of teeth and bones. Sunshine gives Vitamin D properties. Only Mushrooms is containing Vitamin D.
Vitamin E: Vitamin E is protecting body tissue from the damage of oxidation. Blackberries, Bananas, Apples, Almonds, Sunflower Seeds contain Vitamin E.
Vitamin K: Vitamin E is regulates blood calcium levels and fat soluble. Vitamin K is present in green leafy vegetables like Spinach, Broccoli and also in Cashews ( Kaju ), Chestnuts ( Akhrot ).